As posted here and here, our colleague David Glazier observed Guantánamo military commission proceedings against Khalid Sheikh Mohammed and 5 others, alleged to be the authors of the terrorist attacks of September 11, 2001. 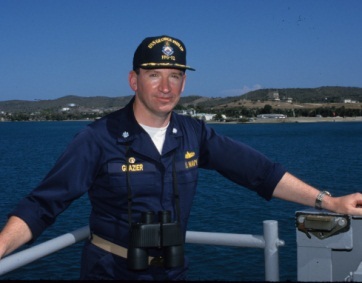 Pleased to share below Dave's insightful reflections on how observers from expert nongovernmental organizations may work to improve GTMO proceedings. He demonstrates that value by posing a strong challenge to the media-generated "circus" motif, a motif that focused on defendants' antics and a defense-counsel-hijab-brouhaha. Pictured above in an April 2001 visit to GTMO, Dave prepared today's report wearing the hat of an observer for an NGO, the National Institute of Military Justice. It's a role that IntLawGrrls Beth Van Schaack, Beth Hillman, and yours truly, along with other NIMJ board members, also have played. “Was it worth it?” Is there sufficient value from “live” observation when one can read the transcripts or watch from a remote site to justify the time and expense of traveling to Cuba? I will describe what I got from the observation experience and let others decide. To at least whet your appetite, let me say now that the proceedings I observed differed a bit from the impression created by media reports. ► Just getting to Guantánamo gives one perspective on the challenges confronting military commission attorneys, particularly defense attorneys, on a regular basis. These include the multi-day lead time for travel approval, and the requirement to show several hours before flight time in classic military “hurry up and wait” style. And there is nothing like flying in 20-plus-year-old aircraft operated by low-budget charter operators you’ve never heard of to inspire confidence. (U.S. troops deploying overseas also frequently get to travel this way.) And of course, you come and go not when convenient, but when these irregular flights are scheduled. ► Next I got to experience the curious realities of military commission security. You must present a passport – the only form of ID accepted – at a checkpoint where you are validated against the pre-approved entry list and undergo a traditional security screening – X-ray of all possessions and metal detector/wand of your person. Next you are led a short distance to a second location where this entire process is repeated in full. (Imagine if TSA tried to adopt this approach.) Only then are you allowed to proceed to the courtroom gallery entrance, where you show your passport a third time and receive an individual seat assignment. I’m tempted to conclude from this passport fetish that these are actually foreign courts. Observers cannot bring any pens, pencils, electronic devices, notebooks, etc. with them – courtroom staff provides loaner writing implements and plain white pads. If this is how U.S. nationals, physically separated from the courtroom by a glass wall, are screened, claims that defendants experience much more rigor, including strip searches, seem entirely credible. ► A real value-added from traveling to Guantánamo is the ability to see the full courtroom, from before the arrival of the detainees (observers had to start our entry process a full hour before the scheduled start time), until the completion of the trial day. Observers sit in a soundproof glass booth listening to the same 40-second time delay as remote observers, and have video monitors showing the same picture. It is generally less surreal to watch the monitors, so what you hear and see match up. But there is merit to being able to see what is happening throughout the courtroom rather than just the view of the currently speaking participant offered on the monitors. ► Watching from the gallery, for example, highlighted the largely dysfunctional attorney-client relationships. The courtroom is arranged with six long defense tables arranged one behind the other. (It was specifically designed for this trial, but former convening authority Susan Crawford refused to approve charges against alleged twentieth 9/11 hijacker, Mohamed al Kahtani, leaving one extra table). The defendants sit one behind another at the extreme left end (as viewed from the gallery) of their respective tables. The lead attorneys generally sat near the right end of their respective table, convenient to the center podium from which they were expected to address the court, meaning but what looked to be at least twenty five away from their client with wholly empty table in between. The small number of assistant counsel, interpreters, and other defense support personnel elected to sit at the “extra” table or along the back wall. This physical separation highlighted the gulf between these attorneys and clients, and the resulting need for the attorney to stand up and walk over to the defendant made it easy to observe how little actual attorney-client conversation took place. 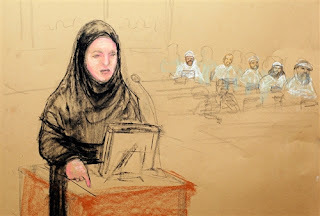 The fact that lawyers for Khalid Sheikh Mohammed and Walid bin Attash lawyers conferred with their clients without use of an interpreter revealed that these defendants’ refusal to wear headphones does not mean they weren’t following trial events; they can do so in English. Surely the military has enough attorneys that it can come up with a second lawyer for a man on trial for his life? ► It appeared from the gallery that the prosecution outnumbered the five separate defense teams combined. ► Media reports belittle hijab-compliant attorney Cheryl Bormann’s complaint about female prosecutorial attire. (credit for drawing by Janet Hamlin/(c) Associated Press) Live observers thought she was a bit over the top, but we at least had the opportunity to observe the prosecution staffer walking about in a tight skirt, heels, and sleeveless top drawing comments from some of the men present, who presumably inspired her comment. I did not see any civilian woman in the courtroom without a jacket on after that. ► But perhaps the most significant thing I saw was five defendants sitting quietly in their assigned chairs for the vast majority of the lengthy day, with approximately twenty uniformed guards sitting in a row little more than an arm’s length away from them, ready to intervene instantly if called upon. From media reports, one might assume this was a redux of the 1969 Chicago Seven trial, with outrageous defendant conduct largely responsible for drawing out the proceedings so long. Other than the extension of the lunch break by continuing prayers – which may have been either schedule confusion or deliberate defendant misconduct – by my estimation what we saw over the course of a thirteen-hour day was substantially less than five minutes of activity that violated traditional courtroom decorum. It could have been limited to mere seconds if the judge had been so inclined. The fact that the judge tolerated even a few minutes’ interruption provides concern that this will just prove to be a dry run for future tactics. But I think the commission’s inadequate preparation for the session – including lack of contingency planning for technical or translation issues, issuance of a new arraignment script the day before trial (unavailable in Arabic for defendant or translator use), last-minute bickering over a pre-trial conference, etc. – were actually much more significant issues for concern than defendant [mis]conduct. Finally, although NGO reps are required to be relatively passive observers, and are not to ask questions at the press conferences or initiate contacts with the media or actual commission participants, I certainly gained a lot from the opportunity to benefit from hearing the views of a number of other participants and observers. I have been a close scholar of both past and present military commissions since then-President George W. Bush announced their use in November 2001, and have read many thousands of pages of Guantánamo transcripts and documents from every case conducted to date. I still found the opportunity to see the events in person to be a valuable complement to that experience. And while many members of the media have done a tremendous job covering commission events, I think that NGO reporting by academics and practitioners with greater specialized knowledge can be a useful adjunct to the mainstream media coverage.